Obviously, I’ve been rocking this trend for a while now with a full blown rabbit art piece above my bed. My art teacher in college asked us to make an image out of sticks that could be our “life logo”, and then we were instructed to draw that stick logo in pencil. I chose to show myself as a tall bunny with all of my shorter bunny friends so only their ears would be showing, as if a photo had been taken and everyone else had been accidentally cut off. All of my senior year roommates in college were at least four inches shorter than me, I kid you not. My teacher thought it was so hilarious and asked if he could put it in the end of the year art show. It was really just an honest representation of my life, but I obviously allowed it, and realized that the last time that had happened was in kindergarten. I guess life really does run full circle? It turned out to be a cooler project than I initially judged it to be, and now it hangs proudly above my bed. It makes me happy, and I’ve decided that’s the only reason to have art at all. Hope you are all having spectacular weeks! I just flew into Chicago this morning and can’t wait to cuddle up with my parent’s dog, Cedric, before running off to the city for a whirlwind trip with my friends. When I get back I’m itching for some redecoration though. Contemplating a makeover on my DIY Ikea bar, any suggestions? Ok, so the Easter Bunny is not bringing me a real rabbit I am sad to say. 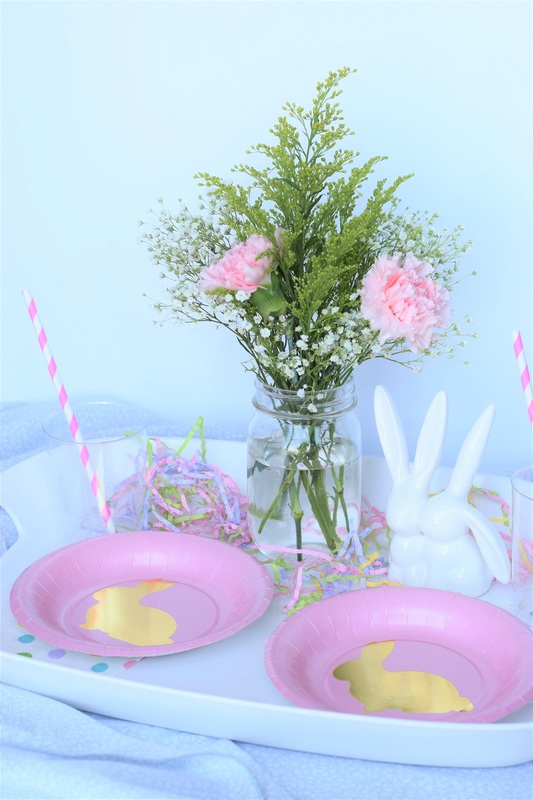 What Easter has brought, however, is a ton of adorable, bunny-adorned house items in all of my favorite stores! 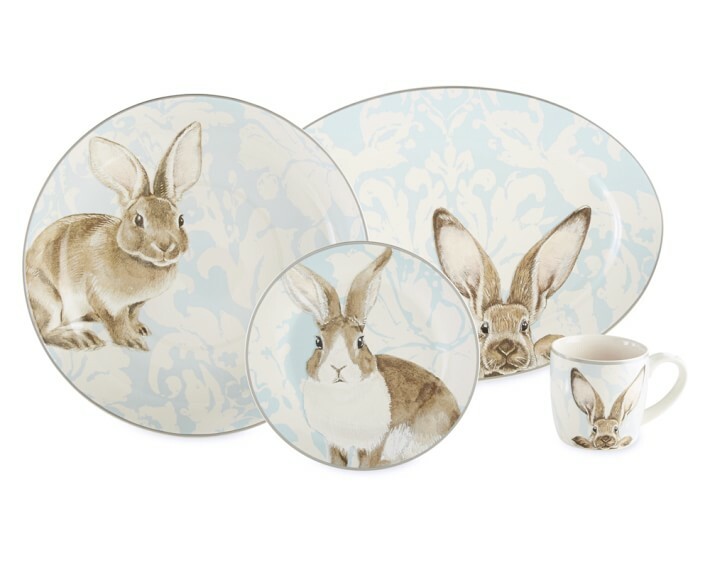 I keep getting emails about the adorable plates, door mats, and rabbit figurines coming to stores soon, so I figured I would share my current obsessions with you. If you’re bunny centered like I am, the best time to shop for these items is the week after Easter. 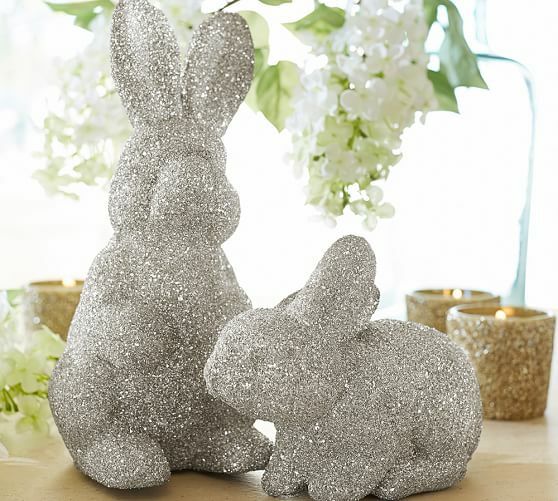 All of the home decorations plastered with rabbits tend to go on super sale right around then…though I’m keen to use them all year long! Wait if you can, otherwise check these adorable chachkies out! 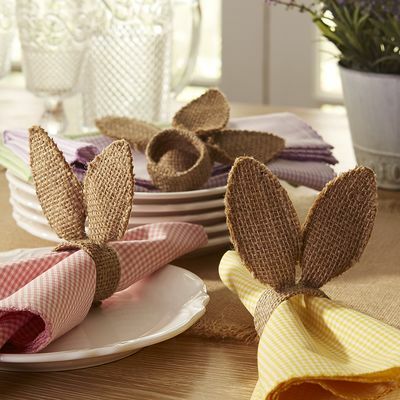 These beautiful dishes at William Sonoma are a fantastic addition to any Easter table. Can’t you see yourself sipping tea from that mug with the bunny peaking right out at you each morning!? 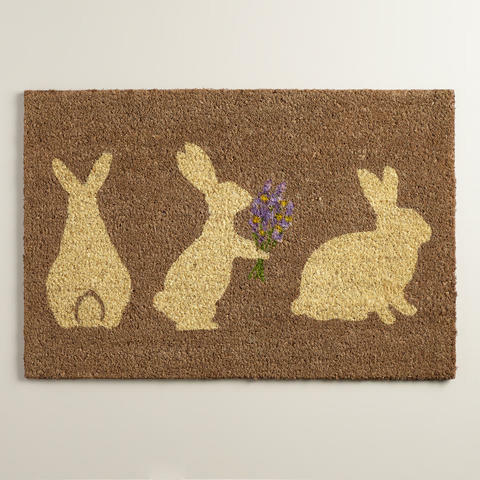 A welcome home from this cute little doormat from World Market would certainly put a smile on my face. And at $12.99, who could resist? 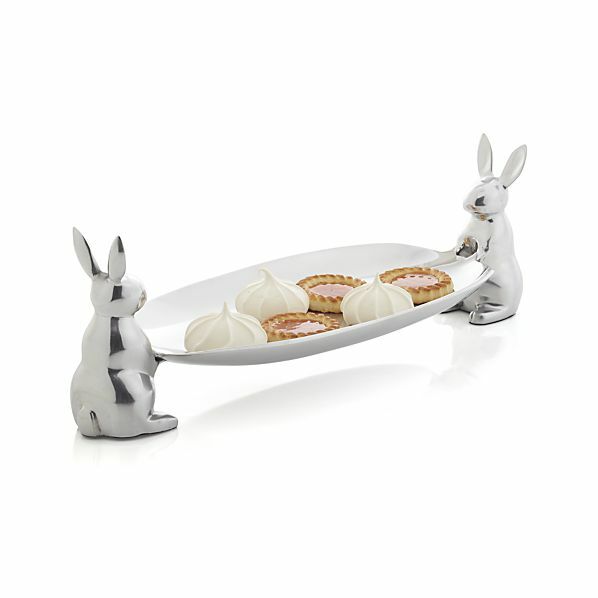 I’m certain you could think of something to serve off of this rabbit serving dish from Crate and Barrel… some raspberry topped lemon lime squares possibly? 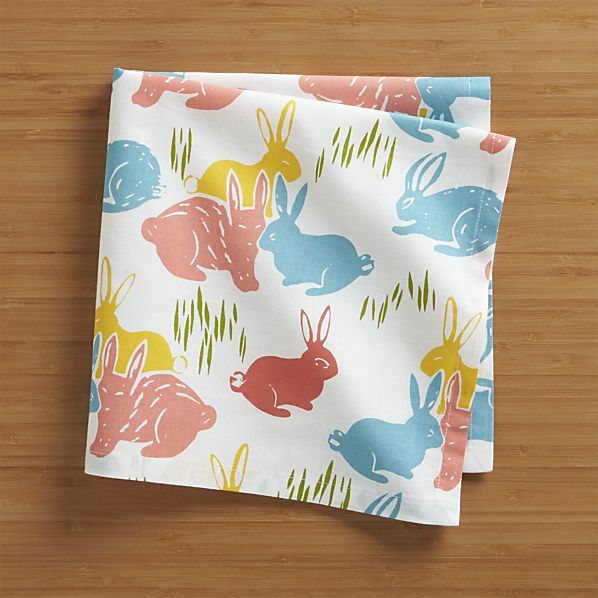 You have an excuse to get frosting all over your face now that these fun bunny napkins have arrived at Crate and Barrel. Wipe and wash and marvel at the adorable print! Sparkles and bunnies together. Need I say more? Find them at Pottery Barn.